← Air Bag light has come on in my VW! Right, you’ve got your OBD2 code reader, you’ve plugged it in, you’ve turned the ignition to position II, you’ve pressed to scan and………’Link Error’ comes up. Okay, what’s going on? Is the reader faulty? Are you doing something wrong? Yes, the reader could be faulty but the greater likelihood is the reader is not compatible with your vehicle or vice versa, if you prefer. There are various protocols within OBD2 compatibility, the latest of which is CAN Bus. Some OBD2 readers do not cover this. Check your vehicle’s communication protocol and if your reader covers it. 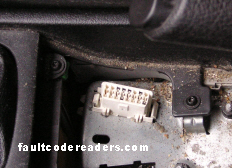 1996 saw the US government introduce mandatory OBD2 compatibility for all cars supplied in the United States market. This is sometimes mistakenly used as compatibility for readers sold in the rest of the world. If your car was supplied in Europe (within an EU member country at the time), compatibility was not mandatory for petrol vehicles until 2001 and 2004 for diesel. The EU standard is actually called EOBD but the OBD2 title has stuck and is more commonly banded around. None of the above is set in stone as vehicles supplied in the rest of the world can still be compatible even if the country they were supplied to have no laws in place. Also, vehicles before those years can be compatible simply because the manufacturer began implementing it before legislation. For example, many Fords can be compatible to as early as 1995 in the EU and beyond. Possibly. Commercial vehicles were not included in the above standards though some manufacturers have implemented it. A car derived van model is likely to have it fitted.